The IPTZ12XIO is a mini IP network pan tilt zoom camera with 1080P resolution and 12X optical zoom. It is equipped with a Sony Starvis image sensor that provides color video even in very low light without needing infrared LEDs. The camera automatically adjusts exposure to provide the best possible picture in color. In complete darkness the camera switched to black and white mode to take advantage of Day & Night switching. The 5.3-64mm varifocal motorized lens provides 12X optical zoom which can be controlled remotely from the NVR, your smartphone, or PC. 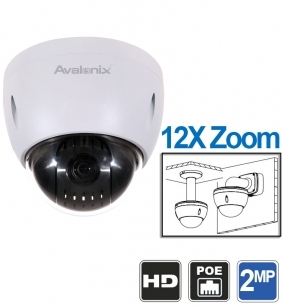 This network PTZ camera also has True Wide Dynamic Range (WDR) to compensate for glare. 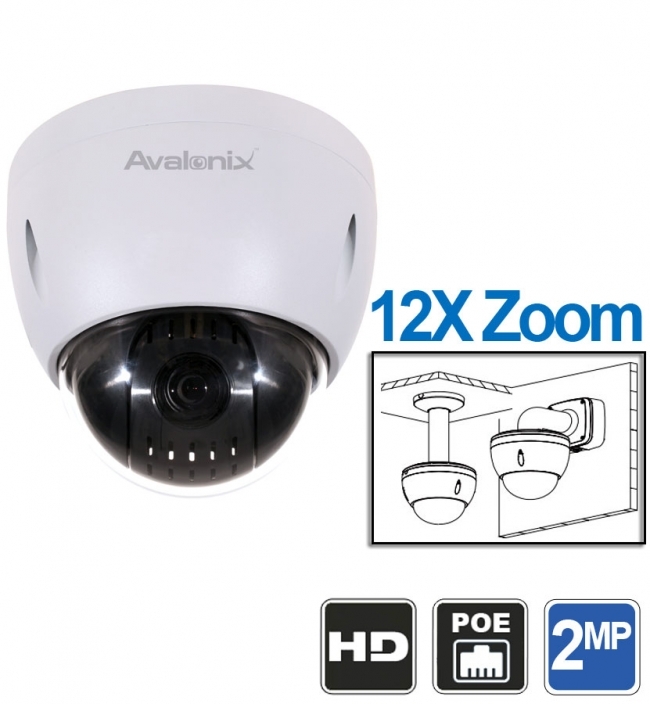 This IP camera can be powered by a 24VAC power supply, or 802.3at compliant PoE+ (power over Ethernet). This network PTZ also offers the latest in H.265+ and H.264+ video compression that provides bandwidth savings up to 50% over regular H.264. The camera has dual-stream encoding, where the main stream is a higher resolution that is recorded on the NVR recorder and the sub-stream is lower resolution for streaming on to a smart phone. You can choose to record the sub-stream as well on our NVR recorders. Can this pan tilt zoom camera be used outside? Is this camera PoE? Yes it can be used outdoors. You can mount directly to an overhang. It is also PoE and is compatible with any of our PoE NVRs. How many people can connect to this camera at once? It can support up to 10 user access simultaneous. Can this camera be integrated into a Qsee NVR QC-826? Yes it will be compatible from the protocol stand point. Just make sure your NVR is not maxed out on the PoE power output and your cable run is not longer than 150ft. Can this be mounted directly to a drop ceiling? Yes it is made specifically for ceiling mount applications. Is this camera compatible with QNAP TVS-882ST3 surveillance station? Yes all of our IP cameras are compatible with QNAP.